We've all heard the phrase - God works in mysterious ways. So true! In 2012 I was diagnosed with a rare genetic disease (Neurofibromatosis Type 2) and the brain tumors that go with it. I hate my tumors but God is a good God and he really does work out all things for the good of those who love him (Romans 8: 28). Because of the tumors I wrote Puzzle House--the book I never wanted to write. I would never have written Puzzle House had I not developed the brain tumors. Rachel Summers, the main character in my new book, PuzzleHouse, also has brain tumors due to Neurofibromatosis Type 2 (NF 2). So exactly how rare? NF 2 affects about 1 in 30,000 people. That makes it extremely rare. It allows tumors to grow anywhere on the nervous system, but especially in the brain (almost always on the auditory nerve and vestibular nerve) and the spine. The tumors are almost always benign, but thereâs two meanings for benign. One being non-cancerous and the other being harmless. The good news is that my tumors are not cancerous, the bad news is they are definitely not harmless. Without going into all the details, I'll just say that Iâm not as healthy as I used to be - and never will without God's supernatural intervention. After reading all that you might think Puzzle House is a really depressing story, right? I certainly hope not. My first goal when writing a story is always to entertain and thatâs true with this one as well. In fact, the subtitle of the story is a novel of healing and hope. Iâm not going to give away the plot but Iâll give you a little hint. While unconscious after an auto-truck mishap, Rachel has a very special visitor who asks, "Do you want to be healed or to be a healer?" She makes her choice and thatâs when her adventure begins. Why did I choose a puzzle theme? Because in many ways life is like a puzzleânot a box of candy! There's lot of pieces that have to be put together before you can see the whole picture. Many times we donât understand why we need a particular piece of our puzzle but God does. If we trust God with all the puzzle pieces of our life, He will use them to create a thing of beauty out of our chaos. 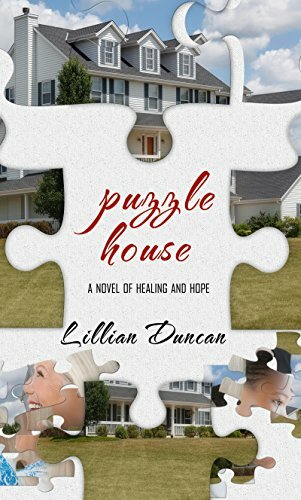 GIVEAWAY INFO: To celebrate the release of Puzzle House, I'm having a very special giveaway on my blog, Tiaras & Tennis Shoes at www.lillian-duncan.com. Leave a comment on one of my Puzzle House posts and youâll be entered to win. Thanks! Life isnât a box of candyâitâs a puzzle! Rachel Summers is all about Rachel Summersâ¦until the day she crashes headlong into a semi-truck. As her life hangs in the balance, she has a visitor who asks a very simple question. She makes her choice, but the journey doesnât go quite the way she expected. And so Rachel now runs Puzzle House. Every guest is different and yet the same. They all come to the Puzzle House for one reason and one reason onlyâto be healed, usually from a life-threatening illness. Sometimes they receive their miracle, and sometimes they discover thereâs more than one kind of healing. Nia is a fifteen-year-old African-American girl who is dying. The doctors have told her there is nothing else to be done. No more treatments. No more hope. No more life. And sheâs angry about that. Very angry. Against her wishes, Niaâs aunt brings her to The Puzzle House. Together, Nia and Rachel will take a journey that will change both their lives. About the Author - Lillian Duncanâ¦Stories of faith mingledâ¦ with murder & mayhem. Lillian is a multi-published author who lives in the middle of Ohio Amish country with her husband and a menagerie of pets. After more than 30 years working as a speech pathologist for children, she believes in the power of words to transform lives, especially Godâs Word. Lillian writes the types of books she loves to readâfast-paced suspense with a touch of romance that demonstrates Godâs love for all of us. To learn more about Lillian, you may visit her at www.lillianduncan.net or www.lillian-duncan.com. She also has a devotional blog at www.PowerUpWithGod.com.